Can’t afford Fiji this year? 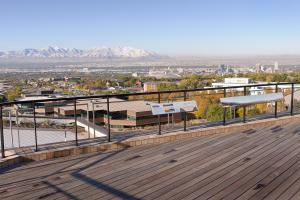 No worries – there are plenty of world class destinations right here in Utah. To truly explore the diversity Utah has to offer could take a lifetime. People come from all over the world to visit well known and world famous destinations such as Zions and Arches National Parks, but there are also less well-known treasures to be discovered. One of those is the Natural History Museum of Utah. Originally housed on President’s Circle in the University of Utah’s first library, the vast collections were at risk there because they were housed in open storage with no climate or temperature controlled. So, in November of 2011 the museum moved into a massive new building where the displays could be properly showcased and the collections could be stored in a way that would preserve them. The move was funded with state, county, and federal money as well as donations from corporations, foundations and private sources. The federal money came because the museum is a Federal Depository of Collection Objects. Which means any artifact found on federal land in the state goes to the museum. Enter the museum and you become an explorer. Turn a corner that looks like a dead end, and it open up into new spaces and new wonders. The museum is not one of just sight, but encompasses, smells, sounds and tactile experiences. The sounds that are played as visitors move from display to display are recordings recorded in Utah or the Great Basin region. Not everything is locked away, some exhibits are made to be touched or even smelled. The museum houses 1.2 million objects. Not all are on display, but some are housed in temperature and humidity control cabinets. Scientists come from all over to do research using the collections. But there is so much on display to see that it could take hours to get through everything. The next room is called, Life. Moving from cells to organisms, to populations and finally to ecosystems, the display is meant to give visitors a sense of what constitutes life. There are microscopes and insect and animal displays as well as dioramas of entire ecosystems. Next comes, Land. The museum only features things from the Great Basin, so the land explored here is made up of the Rocky Mountains and the Colorado Plateau. There are minerals and fossils and displays about plate tectonics, erosion and earthquakes. First Peoples has a re-creation of an archaeological site called Median Village that is located by Cedar City. It also houses pottery, moccasins, sandals, jewelry and one very old rabbit fur robe from 1120 BC. There is a Great Salt Lake display with a picture window, that on a good day, allows for a view of the lake and Antelope Island. Past Worlds are where the big boys live. 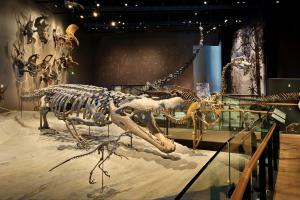 In displays representing the Eocene, Cretaceous and Jurassic periods dinosaurs large and small fill the open space. Utah is a prolific place for finding dinosaur bones and according to Carpenter there is a lot of discovery going on right now. 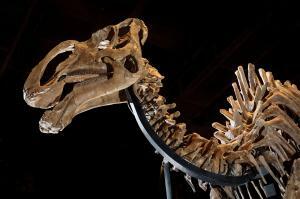 Most of the skeletons are castes made from real bones in the collections, but those behind glass cases and one dinosaur, Gryposaurus Monumentensis, are the real thing. The Gryposaurus was found in a desert climate almost completely intact and was well preserved thanks to the climate. Along with permanent displays the museum features travelling exhibits. The current one is called Chocolate The Exhibition, and explores the history of chocolate. Along with historical information, tastings are offered on special tours. For those who get hungry from the pictures and delightful odors there is a store to purchase a treat. One of the vendors is Millcreek Cacao, a company recently featured in Utah Stories. The exhibit was put together by the Field Museum of Chicago and runs through June 1st. Anyone who has a collection of stamps, coins or books knows that obsession with collecting seems to be a very human trait. The Natural History Museum of Utah takes that obsession a giant step further.